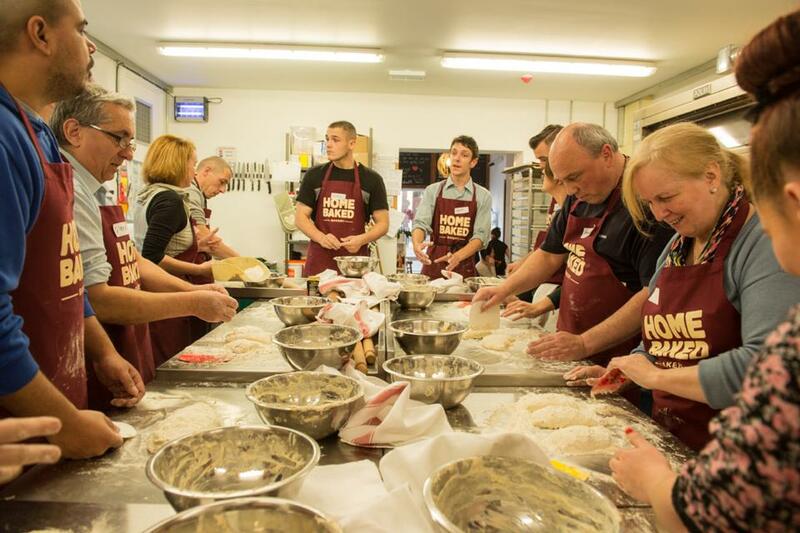 Homebaked is a cooperative bakery in Anfield, close to the famous stadium of Liverpool FC. The bakery was set up as an alternative to the clearance of the neighbourhood by the Housing Market Renewal Initiative. The bakery is the result of an intervention of the Liverpool Biennial that gained great international visibility thanks to the artist Jeanne Van Heeswijk’s commitment to the initial stages of Homebaked. 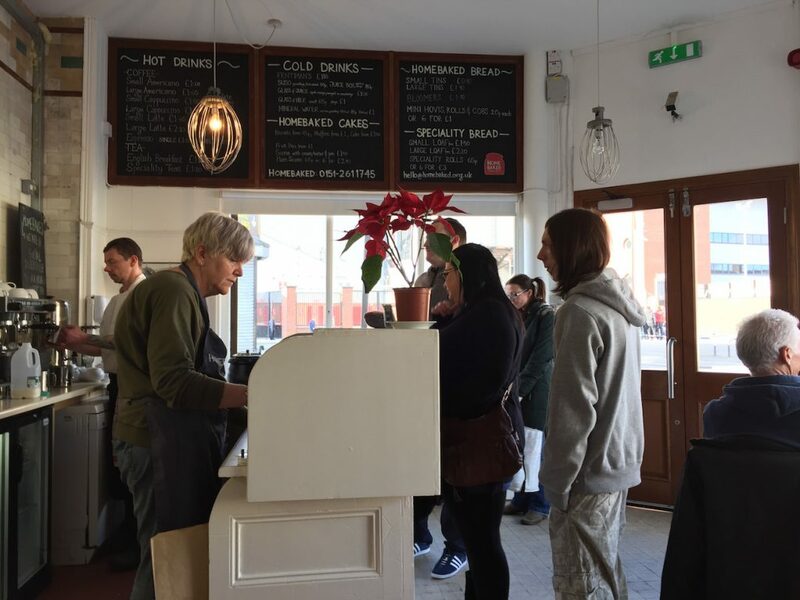 Today, the bakery is part of a Community Land Trust that aims at creating a community-owned system for social housing, cooperative retail and common spaces in the Anfield area. Homebaked was initiated by the Liverpool Biennial in 2010, they invited Jeanne van Heeswijk, a Dutch artist renowned for her social projects, to develop a project in the city. She originally had decided to work with young people, to help them take matters into their own hands, and build custom made houses. 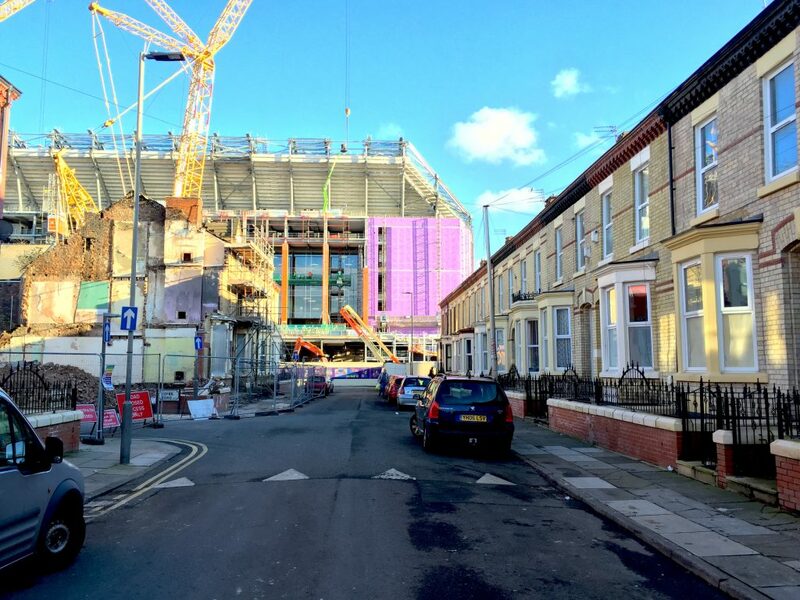 The goal was to take control of the housing market, because since 1999 the houses had started being bought up by the Liverpool Football Club or the City Council. Because of the Housing Market Renewal programme, people were under threat of Compulsive Purchase Order, which forced them to move out in exchange for monetary compensation. People were loosing their homes and getting into even more debt because of the housing clearance. In practice, the Housing Market Renewal programme was not about revitalisation, but about creating a stimuli for the market. Over a period of 18 months, Jeanne worked with the local community and a Manchester-based architecture group Urbed, focusing on co-production processes, to develop a customised, client-based housing model. But the Biennial could not get hold of any house to work on, because of the Compulsory Purchase Order. Jeanne decided to lease the bakery instead, which seemed to be a force that brought people together, because it was a historical reference point. Why did you decide to organise the community around a bakery? The football fans always went there, my parents used to come here…the Mitchell’s bakery was a small family business and has been there for 100 years! When we realised that the bakery was shut down like many other small businesses in the neighbourhood because of the disappearing local market, we decided to go into the bakery, open it to the community and start to use it as a workshop space. The community did some workshops around baking and then decided they wanted to set up a bakery themselves.. Jeanne and the Liverpool Biennial supported the idea: they put their staff behind it, they rented the space out, they built up people’s capacities, and helped the community to set up a cooperative system for the bakery and to establish the Community Land Trust. Although the project was about housing, this bakery somehow took over, as the source of people’s will to get this project done. The Biennale and various media outlets also helped the community share its own narrative about the neighbourhood with the world, and this brought us a lot of support from a variety of places. The bakery first opened on a trial period during the football matches and was a success. We ran a crowdfunding campaign over a period of 28 days to support the bakery staying open all week: it is now the only shop to be open every day within a mile and a half radius, in the middle of a food desert. We crowdfunded 18.500 pounds, which we received from around 495 donors. Recently the bakery has received a grant from “Power to Change” to buy a new pie machine, because we make the best pies in the city and recently won gold for our local specialty ‘scouse’ pie at the British Pie Awards. These pies bring in over 1000 pounds each time when there is a football match around the corner and this revenue goes into the CLT. By buying our pies, people are buying ‘more than a pie’: they are actually contributing to the community-led development of the area. And with the bakery, the community literally started to build itself back together again. Why did you choose the format of the Community Land Trust? The reason why we chose the setup of the CLT is because it is a constituted organisation that allows the community to hold the land: this format allows us to have the lease of land, so it is not about the buildings but about the land, on which we can then build on. Although the original artist is still on the CLT’s board, it is now an autonomous organisation, the lease was handed from the Biennial to the land trust. The CLT originally rented out the space from the Mitchell family and then they rented it out to the cooperative bakery that is the CLT’s sister organisation. 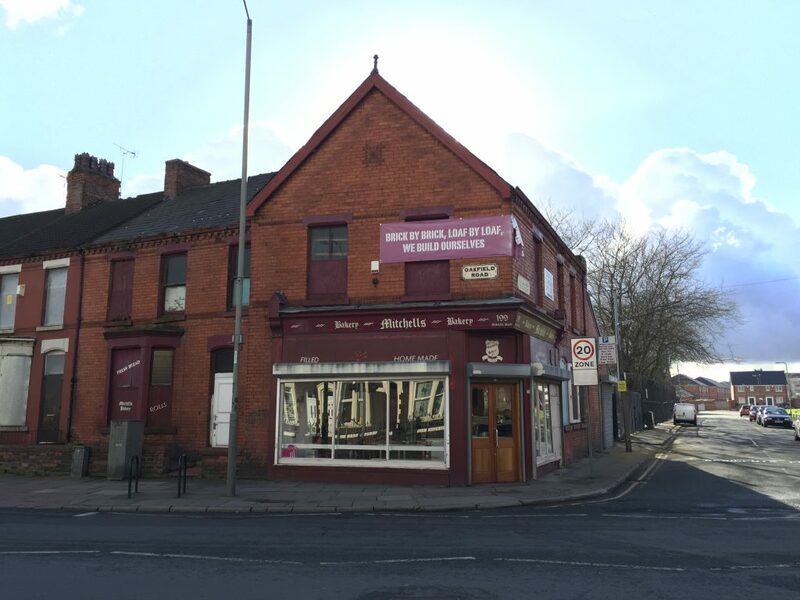 Finally after years of waiting, the council purchased the bakery form the Mitchell family and with all the refurbishments we did, they got a good price, as it is now a viable business. The CLT currently rents from the council but soon we will own the property. The bakery now employs over 11 people, many local residents. The bakery pays the staff a living wage and the rental fee to the CLT, and any profit goes back into training, capacity-building, mentoring and community events. The structure will not allow any profit to leave the organisation. What is the perspective for the future of Homebaked? Currently we are refurbishing the shared flat above the bakery for young people in the community, we have 3 paid local young apprentices designing and building with us and excited to move in. Once the flat is refurbished the council will give us the lease to the bakery and flat for one pound and it will go into community ownership. The bakery is on the corner of a block of 10 houses and through this negotiation we have managed to have the Compulsive Purchase Order taken off the bakery, but at the moment it is still on the rest of the block and the land in the back. Nevertheless, we led a community design process to create an alternative scheme for the houses and land. We developed a scheme to include cooperative high street with a mix of social housing. We also plan to take ownership of the land behind us and turn it into a common space. Myself and local residents are currently developing Home Farm to cross finance affordable fresh food produce for local people that would be sold on our high street by making the neighbourhood of Anfield the specialist in A la carte produce and micro-green growing for the North West. 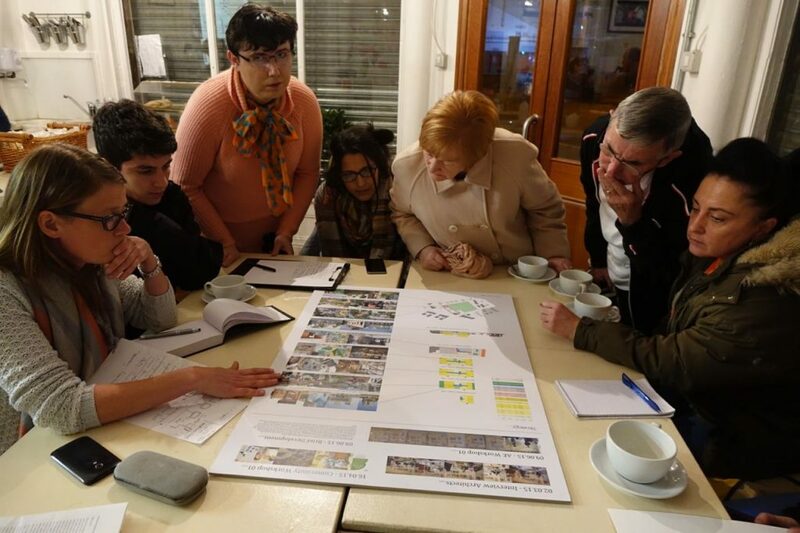 Right now, we are testing out ideas and designing our small civic square, to find out what facilities people want around food production, around play, around public space, because it has to work for quite a lot of members that live in the community. These are exciting times, we have been included in the new master plan for the area, things are changing and moving very quickly and we have to change and move quickly with them to keep ownership in community hands. Community, Economy , commerce, commons, community, community land trust, cooperative, economy, English, finance, food, Funding the Cooperative City, heritage, housing, neighbourhood, ownership, work. Funding the Cooperative City book presentations!